So remember on Monday when I was complaining about how hot it is here and how I was going to be posting cool, no-cook recipes? Well, when that didn’t work for me, I decided to fight fire with fire. And so we’re getting Jambalaya. Before I moved here, I knew that like Red Beans and Rice, Jambalaya was standard Louisiana fare, but I’d never had it. And like most Cajun and Creole comfort foods, it somehow manages to use inexpensive, standard fridge and pantry ingredients while still being unbelievably delicious. In fact, I call this my “Hey, I’m cleaning out the fridge!” meal because it uses up all those odds and ends I never got a chance to use and it’s still probably one of my family’s favorite meals! In fact, if I were a betting gal, I would say if you’ve tried our Red Beans and Rice and liked ’em, you’ll like this even better. I adapted this recipe from my new favorite cookbook. The first time I made it nearly as directed (I cut the meat in half) and while it was delicious, it was also way too hot for us. My husband also felt like the meat-to-rice ratio was too high (go figure that Mr. Meatman thought there was too much meat, especially after I had already halved it!) The second time around, I cut back on the meat even more, but I felt that because the dish gets so much flavor from the sausage, the flavor definitely suffered. Finally, I made two significant changes (just call me Alton Brown with all my kitchen experiments here!) First, I went back to the amount of meat I used the first time, but I processed it in my food processor so the chunks of meat weren’t so overwhelming. Not only did it help with the meat-to-rice ratio problem, but it also distributed the flavor a little more thoroughly. Secondly, instead of using Andouille sausage, I substituted a high-quality Louisiana-style smoked sausage that was more on the mild side. That way, I could control the heat with Creole or Cajun seasoning and salt instead of being at the mercy of the Andouille manufacturer and how hot they decide to make their sausage. This is just one of those recipes that you need to make before you die. It can be served as a side dish, but really, it’s meant to be a main dish. It’s one of those rustic meals that somehow manages to be homey and yet could be served for company at the same time. Just make sure you use a really great smoked sausage (no Hillshire Farms or Johnsonville here–look for something a little more local) and you’ll be good to go. Combine rice and water in a medium-large saucepan and cover with lid. Bring to a boil and then reduce heat to low and cook 20 minutes or until rice is cooked. Remove from heat and allow to stand an additional five minutes. and set aside. Melt butter over medium heat in a very large skillet. When butter is hot and bubbly, add onion, green onions, green pepper, and celery and cook until tender. Add chopped meat and cook, stirring frequently, for about 10 minutes. Add tomato sauce and then add cooked rice. Now start seasoning with the Cajun seasoning. It’s hot, I won’t lie, so if you find that it’s getting spicy enough for your taste but it’s still not salty enough, leave the Cajun seasoning alone and just finish seasoning it with Kosher salt. Cook for about 10 more minutes, stirring frequently. Serve and enjoy! And be sure to save some leftovers–it tastes even better the next day! While rice is cooking, finely chop sausage and ham (in your food processor if you have one) and set aside. Melt butter over medium heat in a very large skillet. When butter is hot and bubbly, add onion, green onions, green pepper, and celery and cook until tender. Add chopped meat and cook, stirring frequently, for about 10 minutes. Add tomato sauce and then add cooked rice. Now start seasoning with the Cajun seasoning. It’s hot, I won’t lie, so if you find that it’s getting spicy enough for your taste but it’s still not salty enough, leave the Cajun seasoning alone and just finish seasoning it with Kosher salt. Cook for about 10 more minutes, stirring frequently. Serve and enjoy! And be sure to save some leftovers–it tastes even better the next day! This looks highly do-able. Most of the jambalaya recipes I've seen have like a bajillion ingredients. I think I'll try it tomorrow! Yummy!! I may attempt this recipe for Father's Day. My dad would love it! I laughed when I saw the title of your post today and wondered what happened to the cool, no-cook dinners! lol. It's great though because we've been having some cool, rainy days here (which is totally bizzare this time of year) so Jambalaya actually sounds fantastic. Hahahaha, Steph, I actually thought about including that! It's "jam-buh-LYE-uh." 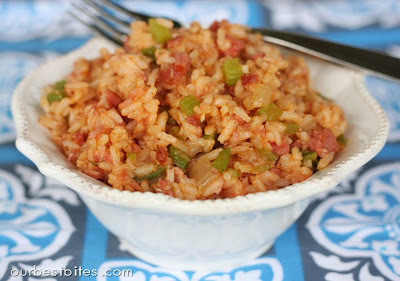 I love jambalaya but have never made it…this recipe looks delcious. That looks tasty! I have been wanting to try Jambalaya. I made this jambalaya for dinner last night and it was wonderful! It immediately made the 'keeper' list on our fridge. My husband loved before he even tried it! I bookmark nearly every recipe you two ladies post and have mentioned your blog on my own–thanks so much! First you need a huge pot. I use chicken (four breats) and sausage, but cut in bite size chunks. I use a large can of diced tomato instead of the sauce. I dust with the following spices 2-3 times depending on your heat likes. White pepper, black pepper, garlic salt, cayenne pepper and a little tony's of course. Cook meats first, add chopped green pepper (2), green onion (one bunch), yellow onion (1). Steam until tender, add diced tomato and cooked rice, (two cups uncooked). There is never left overs. Made This Tonight – Seriously Easy and Super Good! Even My Husband Devoured It And He's Not One To Try New Things. He Even Asked If I Could Pack Leftovers For His Lunch Tomorrow! SCORE! I made this tonight and it was yummy. It makes a TON TON TON. Enough to feed a small army. But it's a great meal to freeze, so it's all good. I liked the flavor, but will definitely add in some shrimp or crab next go around to help give a more authentic taste/feel. Oops commented on the wrong recipe that last time. Anyways, I made this Jambalaya on Sunday night and I absolutely loved it. The only things I changed was that I added carrots to the recipe and omitted the ham. Everything else was as is and it turned out great! Thanks for the recipe! Yummmmm!! Is all I have to say. I am new to the whole cooking thing but I've discovered I LOVE it. And I love this site. All of your recipe's and quick and easy. My husband and I mad the Jambalaya this evening and it was wonderful. I work late and so I had my husband cut everything up before hand, broke out the electric skillet when I got home and put it all together. It was soo easy and tasty. Thank you so much for all of the fun wonderful things you come up with. It was yummy. Honestly, it wasn't anything better than the Zatarains box mix (which is very tasty!). It's nice to have the fresh veggies (but you could just add those to the mix version). My husband is from Baton Rouge and he shares my sentiments. So, if in a pinch for time, just keep some sausage on hand in the freezer and a box of Zatarains on the shelf! I’m making this tonight for our Mardi Gras dinner. My husband served his mission in Louisiana, so hopefully I don’t mess it up. Could the rice be done in a rice cooker? Yep, you could for sure do the rice in the rice cooker! In fact, make the rice now if you have time and then keep it in the fridge–it’ll help the rice from becoming too sticky or gummy. What a great recipe.. Ever since I moved to New Orleans I have become obsessed with gumbo, jambalaya, red beans and rice and cajun seasoning – you name it if its from here I love it. You say lots of garlic but you don’t say when to add. Oops–my mistake! Thanks for pointing it out. You should add it with the onions and other stuff. I made this tonight for dinner and it tasted AWESOME, but it was kind of mushy. Any idea what I did wrong? My husband loved the flavors, too…but noted that it was all kind of “together” instead of separate like your picture. what would be good to serve as a side with this? Loved it. Added it to our family recipe blog. Jambalya is originially from western Africa and from what this liberian lady told me it is suppose to have 2 – 3 different kinds of meat in it, or sometimes from the same animalbut different parts of the animal body. It cost a lot to make the original recipe from what I remember her telling me, so if this is a scraps will do kinda recipe…and it works! Im game on!!! Jambalya is originally from western Africa and from what this liberian lady told me it is suppose to have 2 – 3 different kinds of meat in it, or sometimes from the same animalbut different parts of the animal body. It cost a lot to make the original recipe from what I remember her telling me, so if this is a scraps will do kinda recipe…and it works! Im game on!!! I just wanted to saw I make this recipe without the meat, butter, oil and rice. Instead I add squash and/or eggplant and tons of veggies and love it. I know, kind of weird, but it works!